I have never been too sure about making ear-plugs in the past. Now when I say ‘ear plugs’ I don’t mean the sort of thing I used to wear at night when I lived beneath a flat of late night parting Spanish waiters (how can anyone listen to ‘I will survive’ over and over for hour & half is beyond me!) What I mean are those plugs for people who have stretch their ear piercing so it’s a big hole you can stick biros through. Often they are called ‘flesh tunnels’ which sounds a horrible description to me, often you see various interesting steel or acrylic ones, tunnels are popular I seems as people want to show off the fact it’s a hole and not just a big stud. I have spend a good few hours waiting in tattoo and piercing parlours waiting for friends and ‘the other ‘arf’ to have more ink or holes added to their bodies. During this time there isn’t much for me to do but look at all the steel spikes and bars; or as comedian Dylan Moran put it ‘Stair-rods and nails!’ The few things not made of steel are either carved horn, hardwood, or plastic. I had a play this weekend at making a few, my previous attempts last year I didn’t think much of, but thanks to all the experience I’ve got from marble making I found them much easier to do. In fact the simple shape and challenge of getting an interesting design on such a small canvas was quite addictive! It was also a nice way of testing a few new colours too, but for the time and effort involved didn’t really think I could justify the price I’d need to charge for such little bits of glass. It was then up to ‘er in doors’ (who has a 10mm hole in her right earlobe, and ensures me she doesn’t poke biros though it after a couple of beers) to point me to some websites that sold Pyrex plugs after telling her no-one would be interested in my experiments. Woa! How much! Apart from some of these plugs selling for more than my marbles, the thing that really surprised me was how disappointingly BORING some of the glass plugs are! If you want a nice curvy loop the choice was good, but the plugs were mostly just plain colours, with a few dichroics and the odd red brown swirly coloured one. Firstly, these are awesome - really funky and unusual, and so unlike any tunnels I've seen before. His preference would always be for shorter plugs (with a flatter front) and thought the 'Large 10mm magenta dichoric' looked spot on for size and shape. 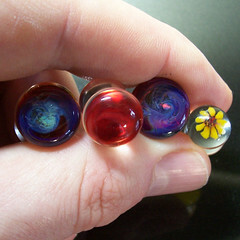 The colours are great (we loved the darker swirly designs, in blues etc) however Shaun also thought that a pair in 10mm and 12mm from clear glass would be great for work if you decide to continue making them? Please let me know if anything like this becomes available! Many thanks for your comments, that's been really helpful (I never thought about clear plain ones for work!) I've been doing a few more to try and improve on the shape, seems like I am nearly there! I will probably try to get some more made, but it's a bit too hot to be playing glass at the mo! You're welcome - I don't blame you for avoiding the flame in this heat... toasty!